Day in, day out, it never ends. The end game? The American Dream. The white picket fence and the two and a half kids. Is it worth it? Does happiness ever come? I don’t believe so. I’m fighting for a new dream. Tell me something, old friend: why are you fighting? 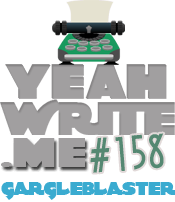 Come join the newest craze over at Yeah Write: The Gargleblaster! I hope you achieve your dream. No longer fighting. 🙂 I hope we all do, no matter what that dream is. Love it. I think that’s what we all strive for. That “perfect life” that seems unattainable. I just think the American Dream is a farce. I think so many of us are scrambling for this perfect life even though we’ll spend 40 years miserable to get there. I’m trying to find another way but there aren’t many options. I’m fighting my Uncle Louie in a egg battle right now. You ever do that? When you bump egg tips to see whose breaks first? No, you’re thinking of sword fighting. I’m talking eggs. Er, wait, no..? To hell with the white picket fence. Great piece. So few words and such a powerful message. Hah! Love that 🙂 Thank you! It doesn’t matter what the dream is. What matters is having one! I’m one of few not “living the dream” amongst many who are… I didn’t know “military wife” was a lifestyle until I didn’t adhere to it. My dream? I don’t know yet. I thought it was school. I thought it was psychology. But the more I look at it, the more I realize how much I dislike the American college system, and I realize how much writing and poetry has been a huge part of my life for… well, all of my life. I just want to do something I love and make money with it, ya know? What happens if the dream is to not chase a dream? I think a dream ought to come at you like a fortune cookie. Crack one open, get a dream. I’m down. My luck, I’ll get the dream of becoming a fish monger in a land-locked down. Maybe it’s good it’s not so easy! I think I should come here more often. Loved your six-words sentence, by the way! Lot of hope and determination..well done. There are plenty of other dreams to choose from, they just don’t get as much press. I guess they aren’t as good for somebody else’s bottom line. I liked your bottom line, though. Welcome to the fight. That’s awesome 🙂 I’m back and forth on the kids. I’ll definitely be an older mom if I ever have them! Growing up, I was not one to be planning my imaginary wedding or dreaming of kids. (I very nearly didn’t have any… dealing with them while waitressing through college didn’t help.) After college, I figured I’d climb that corporate ladder all the way to the big windowed offices. Well, I watched those people in the big offices for a couple years and it didn’t look like they were having much fun… or spending any time gazing out the window, so I decided to hang out at the bottom of said ladder. I worry about my work, and that’s it. I definitely still like my job (which is good) but I just can’t see myself doing it forever. For now, it is just a means to an end; a way to pay my bills until I can do what I really love. Thanks for stopping by! I hope you find your new dream. We’ll never longer suffer the dreams of our parents. We no longer strive towards the same “perfect” life. We no longer feel the pressure to conform, to be the nuclear family, to fit in. White picket fence means so much more than most people would have you believe. It means conformity. It means a mortgage and property taxes. It means yard maintenance and a constant fight against the elements. Who needs that? Who wants that anymore? as I turned 40 (a few years ago) I realized this very thing. You chase, you run, you compromise, you might settle, you might FIGHT for the things you want but there is little relief in it. I hope I never stop chasing what I dream of, even if that dream comes true. I just wish I had the hope and belief that it could come true for me. Thank you! I definitely will never stop chasing it. I think as long as I’m still chasing, I can be happy 🙂 Thanks for stopping by! I love the conversation that you started! I always tell myself not to chase getting a whole lot of stuff that I then have to worry about paying for and taking care of. It’s worked pretty well so far (although I do have quite a bit of stuff, which I realize each time I move). 😄 I was not expecting this conversation and I love it! I love the “new dream”! What a great, hopeful, inspiring poem. I’ve pretty much got the American dream, wife and all 😉 – but that doesn’t stop me from dreaming. (We did stop short of that half-kid. Two is plenty for us. *grin*) Thanks for posting this, Arden! Haha – The half kid used to always crack me up! I was just always pushed toward this way of life that everyone did. It’s just not for me, you know? I’m just glad I realized it sooner rather than later! Amen to that….not everyone has the same dream! Exactly! I just wish everyone wasn’t pushed toward it at a young age! Really… the grass is never greener is it? Fight for what is right in your own heart, surely! lol I remember being what? 12? 13? And my mother used to talk about wanting GRANDKIDS! I was like MA! I’m TWELVE! She passed when I was 23… that was the game changer. My family blew apart so I eventually wanted to make one of my own. Oh, I’m so sorry. My mom is luckily not talking about grandkids yet! Marriage talk is all over the place though! I am a fan of fighting for dreams, new and old.